As a new homeowner, big renovation projects can consume your attention, but once the dust has settled, adding window treatments can be the finishing touch to all your hard work. Plus they’ll give much needed functionality that you’ll wonder how you lived without. Danae of The Homebody House has been restoring her first home for the last 2 1/2 years and finally ditched her off-the-shelf blinds for tailored shades that fit her home’s style. Danae made do with some off-the-shelf blinds for a while, but after two and a half years it was time to find window treatments that actually matched her home’s style rather than just serving a functional purpose. “I spent many many weeks pouring over online sites offering custom shades but always came back to Blinds.com because their site was easy to navigate and the fabric selection was massive! Danae’s home is full of rich textiles and muted neutral tones, so she took advantage of our free fabric samples to find the color that would work best for her space. For the dining room, Danae chose Blinds.com Roman Shades in a nubby, sheer fabric called Cambria Spice. The open weave lets lots of light glow through, while a light filtering liner offers complete privacy and protects the fabric from sun damage. A cordless lift gives the windows a clean look and means no dangling cords are within reach of little ones. Learn more about kids and window covering safety. For the master bedroom, Danae went with Blinds.com Roman Shades in a warmer taupe called Navarro Cornerstone. This fabric has more heft and lots of hues woven throughout, so it’ll work in almost any space. A blackout liner allows for more uninterrupted sleep and blocks heat to keep the home cooler. Danae chose Blinds.com Roman Shades in Cambria Spice with a light filtering liner for the dining room and Navarro Cornerstone with a blackout liner for the bedroom. Both shades have a cordless lift. 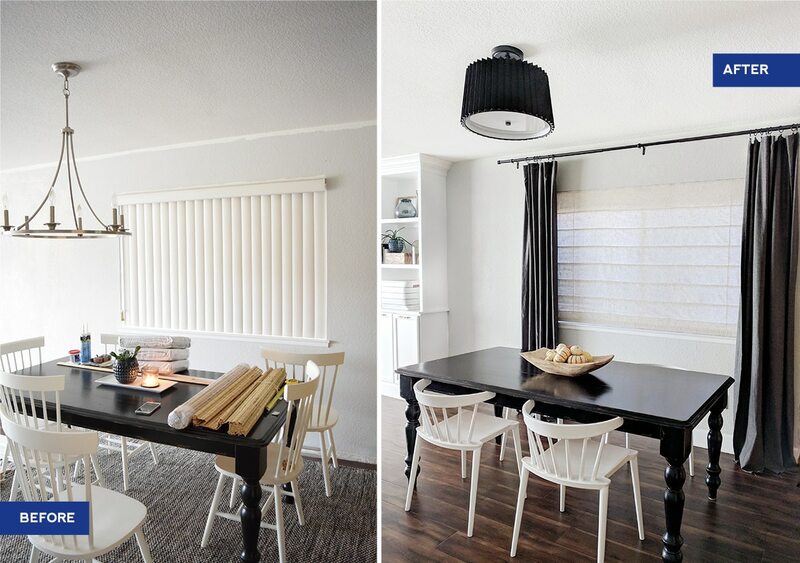 See more of The Homebody House in Danae’s post – Custom Roman Shades with Blinds.com.